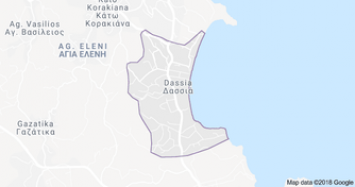 Dassia is located 12 km north of Corfu town. It is a busy tourist resort with many large hotels and a long pebble beach, watersports, Greek restaurants and easy daytrips. Dassia gets its name from the Greek word ‘Dasos’ which means forest and due to the many forests in the area and with dazzling views across to the mainland. Take a look for your Supermarket and Souvenir shop here! It’s a fairly small place and the shops, bars and restaurants are strung along the coastal road. Pace wise, the evenings are just the right side of lively, while days on the beach flit between sunbathing and trying out the watersports. After sunset, Dassia has a friendly, relaxed feel – think lively tavernas rather than pounding clubs. Eateries serve up a range of cuisines from traditional Greek to Indian and Chinese. After dinner, while there are plenty of places to just kick back with a drink, you can also find live music, quiz nights and karaoke if you’re in search of more life. There are pony treks inland and coves to be explored by boat. Otherwise, you can head to the coastal villages of Gouvia and Kontokali for cobbled lanes, the remains of a Venetian shipyard and one of the oldest churches in Corfu. They can be reached in about 30 minutes, and there’s a rather lovely marina between the two places.